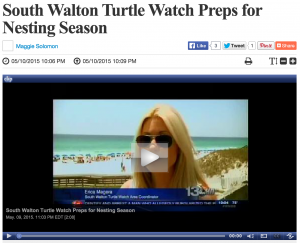 May marks the beginning of sea turtle nesting season. Volunteers who watch over the nests haven’t spotted one on the beaches of South Walton yet, but they’re still asking for everyone’s help as we move more into the season. Erica Magera’s mornings begin around 4:30. She gets to the beach before the crowds arrive to look for something many may not even know is there.